Chris DeLong joined CCMC in 2014 as the community manager of Providence in Las Vegas. Under his leadership, the community led the way in leveraging technology and communications in community associations. He also assisted with securing a $1.9 million grant to complete a community park, storm water infrastructure and area development. In acknowledgement of his work, Chris recently received the 2017 Manager Spot Light Award from Community Associations Institute (CAI) of Southern Nevada. 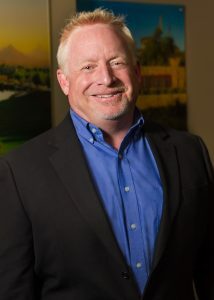 He is recognized as a Nevada Community Association Manager (CAM), Certified Manager of Community Associations (CMCA) and Association Management Specialist (AMS). Chris began his career as an industrial engineer, but when a developer friend offered him a position managing resort condominiums, he accepted. Later, he would move into master-plan community management and oversee the formation, development and transition of a large master-planned community in northern Arizona.